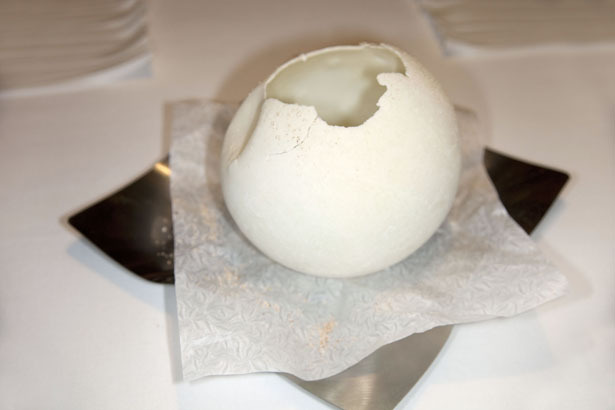 Being a self confessed foodie, the idea of eating at El Bulli is something that is regarded as the Holy Grail. However the chances of securing a table are very slim with over one million hopeful diners vying for the 8000 covers available every year. 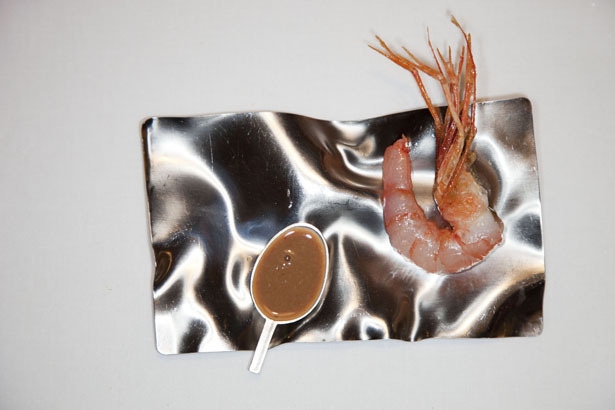 When in Barcelona I met with Txema Salvans, a photographer who had done some work with Ferran Adrià and I asked if his influence could help secure that elusive table. He thought not, but to help his motivation I offered to give him a print as an incentive. I thought nothing more of this until I received an e-mail saying this had indeed been achieved, and the date proposed was 7.45pm on Sept 28th 2010. The print was duly dispatched. So here we are 3 months later driving up the winding and beautiful road from the nearby resort of Roses to the remote El Bulli to fulfil this mission. As we arrive, other pilgrims are wandering around outside and are having their photos taken by the restaurant sign. We meet a group who run the best Japanese restaurant in Sao Paulo; their European trip is all centred around this one meal. We head inside and are asked if we want to visit the kitchen. 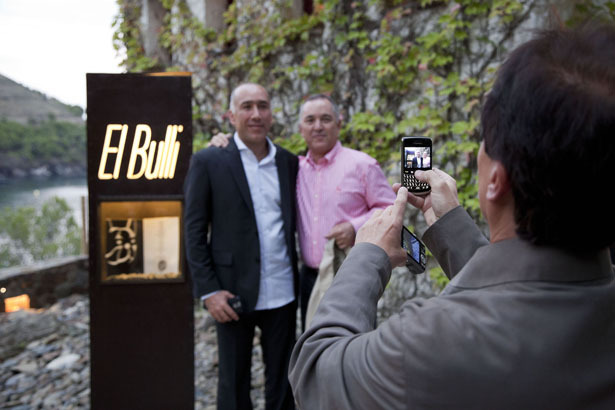 We, of course want to, and there is Ferran himself, checking, tasting, and looking very busy. This is a surprise to see, as we are now used to the idea that Jamie, Gordon et al, are never seen in their kitchens, they are too busy being celebrities. In the background is team of young chefs, rolling, spooning and all being very industrious, it could be as many as 30 and we know that El Bulli has twice as many people cooking and serving, as there are covers. The scene almost resembled an assembly line in China. We have our photo taken with Ferran and head for our table, and the dishes start coming, there are 42 and each one is explained and presented as they arrive. The service, and the smooth sommelier are all very good indeed. The dishes range from being totally delicious to down right weird. They are all small and very rich. No bread is served, although it would be quite nice to have some to alleviate the richness. As we ooh and aah our way through the courses. We are cracking our frozen Gorgonzola globe, and saying how good it is, but a bit early in the meal sequence. So although this is all pretty amazing, it is not exactly perfect, as the balance is all a bit wonky. We are overwhelmed with protein and wonder why Ferran does not do vegetables enough. By about course thirty, we are starting to flag and the Maitre D spots this and he comes over to discuss our progress. We agree to skip the final three savoury courses and go to the start of the desert courses, which number a mere eight. So the pleasures of ‘game meat macaron’, ‘hear loin with its blood’ and ‘hot strawberries with hare soup’ we will never know. The finale is something called ‘box’ which is a huge box of chocolates, we could of course eat the lot, but struggle to have one each. By now it is 12.15am and we are ready to depart. Our banquet was four and a half hours long, and the service was never slow, the dishes just kept coming. The strange thing is that although we have had some of the most remarkable food we have ever tasted, the whole experience lacked the satisfaction of thinking what a great meal. The food lacked balance, not enough great things with vegetables and too overwhelmingly rich. However we would not have missed this for the world, as the meal felt like an unforgettable night at the theatre.